A Burmese court will give its verdict on opposition leader Aung San Suu Kyi's appeal against her extended house arrest next month, her lawyers said. Government and defence lawyers made their final arguments in a Rangoon hearing that was closed to Ms Suu Kyi. She was found guilty of violating the terms of her house arrest after a US intruder stayed at her home. 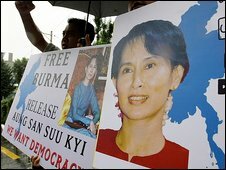 Ms Suu Kyi was sentenced to a further 18 months' house arrest, which will keep her out of elections next year. She has already spent 14 of the past 20 years in detention. Her appeal hearing came a day after Burma's military rulers announced they would grant amnesty to more than 7,000 prisoners. They were expected to be released on Friday to mark the 21st anniversary of the seizure of power by the military junta. Twenty political prisoners are reported to be among those to be released, including two prominent members of Aung San Suu Kyi's National League for Democracy (NLD) and two journalists jailed for their reporting of Cyclone Nargis last year. Human Rights Watch has reported that the number of political prisoners in Burma has doubled in two years, to 2,200. Burma has been ruled by its military since 1962. The NLD won elections in 1990 but the military never allowed it to take power. 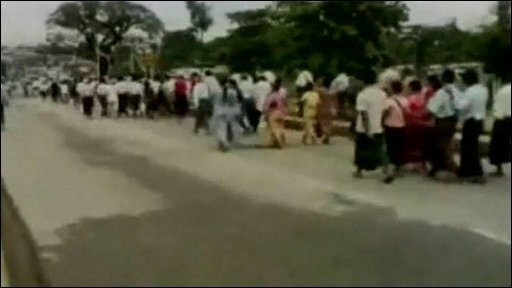 Meanwhile, there have been at least seven explosions in the northern part of Burma's main city, Rangoon. A Burmese official said there was minor damage but no casualties. Information coming out of Burma is tightly controlled by the military government and there has been no indication of who may have been behind the blasts.